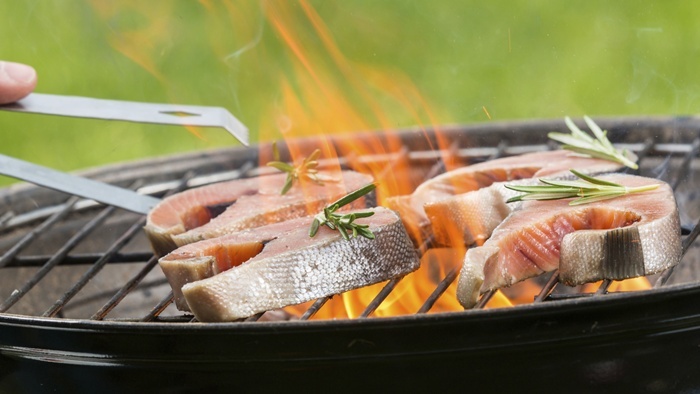 Barbecued salmon is one of my favorite foods. Gently grilled to perfection, what could be better? For me, a delicious meal in the works is grilling wild Pacific coho salmon on my barbecue with various types of sauces. All the while sipping on my favorite glass of red wine, of course! Salmon is king of the kingdom as far as heart-healthy foods are concerned. Not only is this type of fish full of protein and vitamins like E, A and D, it is packed full of healthy omega-3 fats. These fats, known as EPA and DHA, are found within the fat of this royal fatty fish. These omega-3 fats are associated with lower rates of heart disease, blood pressure, cholesterol and inflammation. These fats also control blood sugar and improve insulin sensitivity. Vibrant, red and succulent BBQ salmon, oh my! Try two to three servings per week for optimum heart health. Oatmeal is also right up there as a heart-healthy food choice. I eat this every morning and have been doing so for years. Just add some blueberries and raw nuts. This food truly is a breakfast of champions in my opinion. Oatmeal lowers cholesterol and blood pressure. It is an excellent source of carbohydrates and maintains blood sugar for longer periods of time. It is also an excellent source of soluble fiber and beta-glucan, which interacts with your gut bacteria protecting you from infections and disease. If you want to improve insulin sensitivity and also reduce your risk of developing diabetes, oatmeal is what I recommend. Oatmeal makes the perfect way to start your day every morning. Extra virgin olive oil is also a major player in the protection of your heart and arteries. This oil, typically consumed in moderate amounts in Mediterranean cuisine, is linked with lower blood levels of cholesterol, triglycerides and reduced blood pressure. It also prevents particles from sticking to the inner linings of your arteries going to your heart, keeping them clean and free of plaques. This superstar oil also contains important antioxidant chemicals that can reduce inflammation and prevent damage to your heart muscle cells. Aim for one to two tablespoons every day drizzled on your fresh vegetables. Blueberries are as delicious as they are nutritious. These berries are not only full of soluble fiber and vitamins like folate but also contain pigmented chemicals that act as strong antioxidants. These wonderful fruits help protect you from heart disease by releasing the proanthocyanidins into your bloodstream, which keeps cholesterol and blood clots from sticking to your artery walls. They also keep your arteries relaxed and reduce blood pressure. They can even keep inflammation levels in check. I recommend eating one serving every day, about half a cup. Nuts are nutritional powerhouses that pack a real heart-healthy punch. Raw nuts without salt are full of minerals like magnesium and vitamin E, and offer a great source of fiber. The consumption of nuts can also control cholesterol, triglycerides and blood sugar levels. They can reduce harmful levels of inflammation and help keep the inner aspects of your arteries clean. The best thing about them is that they are full of omega-9 fats, tasty and versatile. The daily intake of nuts has been linked to the reduction in the incidence of heart disease and stroke. Almonds, pecans, walnuts, cashews—take your pick! Davis, J.L., “25 Top Heart-Healthy Foods,” WebMD website, August 25, 2009; http://www.webmd.com/food-recipes/features/25-top-heart-healthy-foods, last accessed July 4, 2014.